The city’s real estate industry has plenty at stake in November’s election for the next New York attorney general. On top of serving as the state’s chief legal officer, the AG greenlights the development and sale of condos and co-ops throughout the five boroughs. “It’s about striking the right balance in understanding what New York needs” when it comes to housing supply, said Mitchell Korbey, a partner at Herrick Feinstein. Erica Buckley, former chief of the Real Estate Finance Bureau in the AG’s office and a partner at Nixon Peabody, said it’s crucial for Eric Schneiderman’s replacement to be well prepared for that part of the job. Though the office frequently served as a mediator between developers and low- to middle-income owners over issues involving construction defects in the past, it has shifted away from intervening in such cases, she noted. “There’s a tendency to want to just focus on the glitzy enforcement work that [the attorney general] does,” Buckley said. New York Solicitor General Barbara Underwood was appointed to serve out the rest of Schneiderman’s term on May 22, but she has indicated that she won’t run in November. Meanwhile, several contenders have emerged — from Public Advocate Letitia James to private Manhattan attorney Keith Wofford. To get a better understanding of what’s at stake for New York real estate, The Real Deal zeroed in on five of the leading candidates as of late May, including the Democratic and Republican frontrunners and the biggest independent wild card. James inherited the “Worst Landlords Watchlist” from her predecessor, now-Mayor Bill de Blasio, and her push to keep outing real estate’s bad actors has ruffled some feathers. One landlord, Kamran Hakim, filed an unsuccessful lawsuit, seeking $15 million in damages, claiming he was unfairly put on the public advocate’s list in 2015 and 2016. Some real estate players are wary of the former City Council member and lawyer who won the Democratic nomination and the governor’s backing, but others see her as hard to peg due to her track record, said one political strategist. 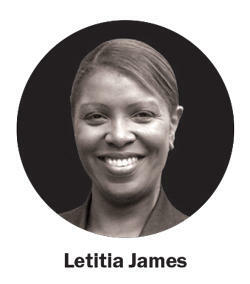 During her nearly 10 years on the City Council, James backed more than one major development project in Brooklyn. She had once opposed the nearly 2 million-square-foot City Point complex and the BAM South development, but eventually threw her support behind both projects after pushing for specific demands and facing pressure from her constituents. 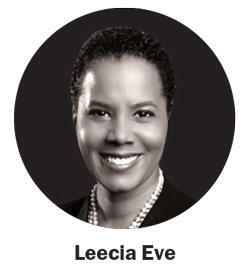 Even though she has yet to play a central role in real estate, Democratic contender Leecia Eve is no stranger to what it takes to build. “She has an understanding of how development works and the importance of it,” said Gary Rosen, founding attorney at Rosen Law. The former Buffalo lawyer also knows politics. She served as counsel and homeland security adviser to Hillary Rodham Clinton and counsel to Joe Biden during their U.S. Senate terms. And since July 2017, she has served on the Port Authority’s Board of Commissioners. Much of Eve’s recent work has involved public-private partnerships and regulatory issues — both of which are key to real estate. The AG role is a balancing act of going after bad actors and working to ensure that businesses know the rules they have to play by, Eve told TRD. 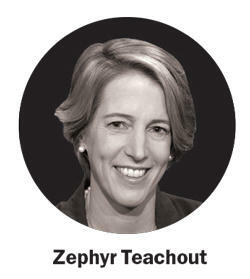 Back in 2014, Zephyr Teachout, a law professor at Fordham University, waged an impressive primary challenge against Gov. Andrew Cuomo, snagging a third of the votes. Two years later, she ran an unsuccessful bid for a seat in the U.S. House of Representatives. Now Teachout is working to secure enough petitions to get on the ballot as a Democratic contender in the AG race. “I don’t think she’s got strong name recognition. Voter memories are short,” said Steven Greenberg, a Siena College pollster and former press secretary for two New York State Assembly members. Teachout did not respond to requests for comment. 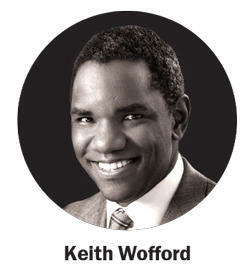 Republicans nominated attorney Keith Wofford last month during the party’s two-day convention, and it doesn’t seem likely that his opponents will push for a primary contest. But that is the least of his worries. It’s been nearly two decades since a Republican has won statewide office. George Pataki won his third term as governor in 2002. Before he secured his first, it had been more than two decades since a Republican candidate had occupied the office. And the last Republican AG left office in 1998. Of all the candidates, however, Wofford is most likely appeal to real estate. He is a co-managing partner at Ropes & Gray, a global firm whose New York office focuses on several practices including real estate, mergers, bankruptcy and securities litigation and white-collar crime. Before joining the firm, he worked as a securitization analyst at Moody’s. Wofford has billed himself as the race’s underdog and one who is separate from party politics. “Voters are going to recognize that any machine candidate will lack credibility to clean up collusion and corruption in the government,” he told the Wall Street Journal. Wofford did not respond to requests for comment. 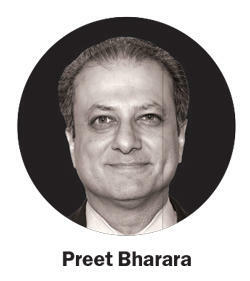 A growing number of voters are banking on former U.S. Attorney Preet Bharara running as an independent. The state’s Reform Party initially threw its support behind him, but he didn’t accept the endorsement. As U.S. attorney for the Southern District of New York, Bharara led anti-corruption investigations into Assembly Speaker Sheldon Silver and Senate Majority Leader Dean Skelos, untangling kickback schemes that allegedly involved developers Steve Witkoff and Glenwood Management. He also oversaw a probe into whether Mayor de Blasio solicited donations from developers and other industry leaders in the city in exchange for political favors. Craig Burnett, an assistant professor of political science at Hofstra University, said Bharara — who was fired by the president last June — would have a better chance running as a Democrat. “He has broad name recognition, he has a reputation for fighting corruption, he has significant experience in a similar post, and Trump fired him,” he noted. “That’s a pretty broad potential constituency to speak to while running for statewide office.” Still, Burnett said he doesn’t think it’s likely that Bharara will throw his hat in the ring. Bharara, through a spokesperson, declined to comment.